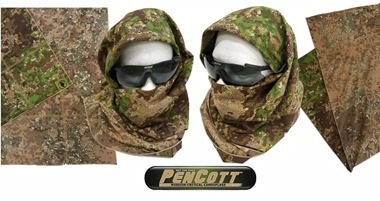 0241Tactical PenCott Shemaghs are made from 100% 50 Denier Tafetta officially licensed PenCott material produced in the USA. Our Shemaghs are 44 X 44 inches square with a rolled hem along the edge to prevent fraying and rips. Our Shemagh will provide protection from direct sun exposure, as well to protect the mouth and eyes from blown dust and sand. Additionally (and unlike typical checkered Shemaghs) our Shemagh will enhance your overall camouflage scheme by blending perfectly with your PenCott uniform and equipment. Choose between single sided Shemaghs OR dual sided with your choice of PenCott patterns to be used together! This is a limited run of items so get yours while you can!